Inspecting the traceability status, doing coverage analysis, calculating the impact of change, preparing meaningful management reports: That’s what the YT Analysis perspective is for. If instead you want create, modify, or delete links, please see the section on YT Editor . The dashboard application gives you an overview of your traceability project and the option to drill down quickly to specific aspects. The query application allows you to write and run your own queries, in order to answer customized questions and deliver very specific evaluations pertaining to your individual project and trace model. The YT Analysis perspective consists of a couple of views that are, by default, arranged in a particular order and have particular sizes. You can change this arrangement at will, and you can even save your preferred arrangement as a new perspective or override the default settings of the YT Analysis perspective. This section gives an overview of the YT Analysis perspective. You will find more detailed information in subsequent sections. The dashboard provides answers to typical questions in traceability projects. For answers to not-so-typical questions, please see the section on customized queries. Which kinds of trace links do we have and how many of each? What are the artifacts we have and how many of each type? Which of our artifacts have trace links to other artifacts, in total as well as broken down by artifact type? Which of our artifacts do not have trace links to other artifacts, in total as well as broken down by artifact type? Read an introduction on requirements coverage and what YAKINDU Traceability can do for you in this regard in the blog posts "What is requirements coverage and how can it be analyzed?" 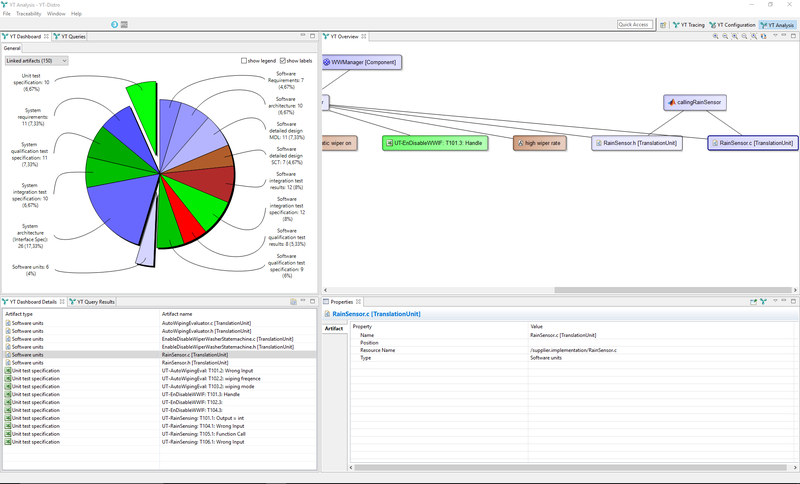 and "How to analyse your project status with YAKINDU Traceability". The YT Dashboard view (top-left) displays a breakdown of the linked artifacts, including their numbers. 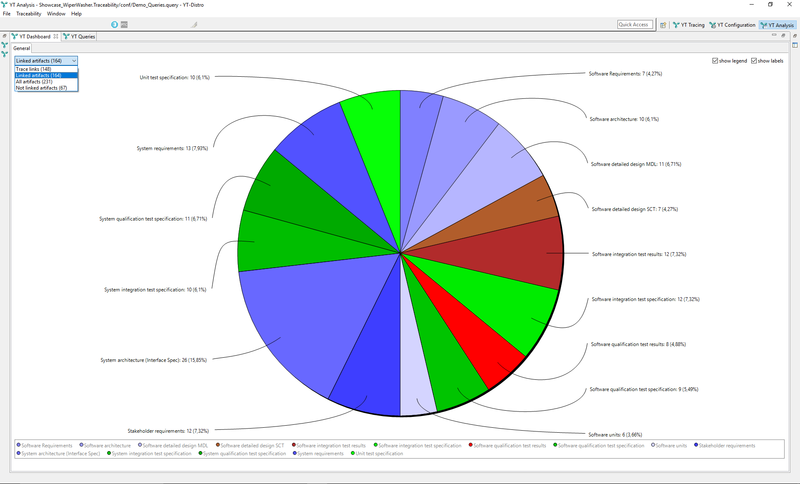 Each pie chart section represents a different artifact type. Selecting one or more pie chart sections makes them explode and displays their contents (here: artifacts) in the YT Dashboard Details view (bottom-left). Selecting an artifact in YT Dashboard Details displays its properties in the Properties view (bottom-left) and its relationships to other artifacts in the YT Overview view (top-right). Section "The YT Dashboard view" has more details on using the dashboard. Hand-crafted queries in the YT query language have been established in a .query file (right). 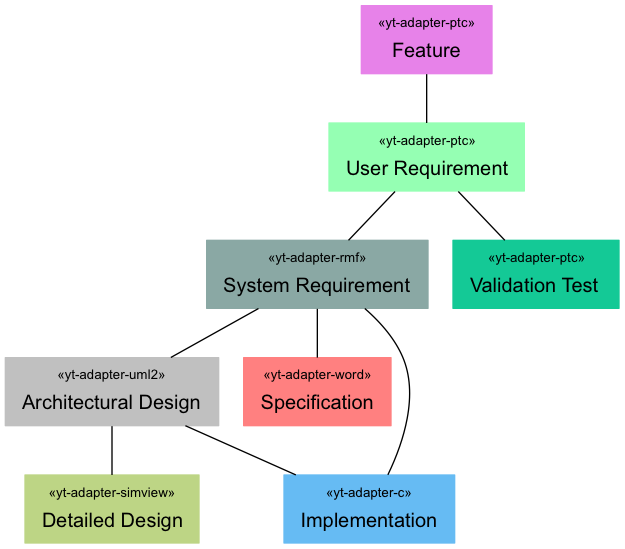 In this example, the idea is to trace stakeholder requirements to the results of software qualification tests, but only to those tests that have been executed successfully. The YT Queries view (top left) shows a tree view of query files (here: only one) and the queries therein. Double-clicking on a query executes it. Results are shown in the YT Query Results view (bottom left). Section "The YT Queries view and the YT Queries results view" has more details on working with customized queries. In the main menu, select Traceability → Perspective → YT Tracing. In the main menu, select Window → Open perspective → Other…. In the Open perspective dialog, select YT Analysis, and click on OK. If you have opened the YT Analysis perspective before, you can change to it by clicking on the YT Analysis button at the upper right of the YAKINDU Traceability window. 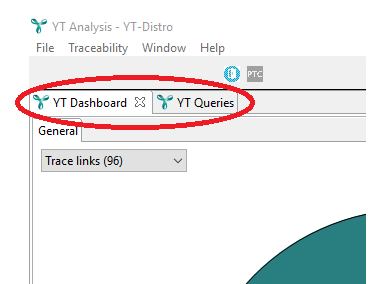 In the YT Analysis perspective, you will find the YT Dashboard and the YT Queries tabs near the top-left corner of the YAKINDU Traceability window. At least this applies to the default settings of the YT Analysis perspective. You can rearrange the views making up the YT Analysis perspective as you like and save the result as a new perspective or override the YT Analysis perspective’s default settings. The YT Dashboard provides a graphical overview of commonly-used traceability metrics for the current project. Trace links: Shows all available links, grouped by link type. Linked artifacts: Shows all available linked artifacts, grouped by artifact type. All artifacts: Shows all available artifacts, i.e., linked and not linked ones, grouped by artifact type. Not linked artifacts: Shows all available not linked artifacts, grouped by artifact type. A counter right from each option in the drop-down menu indicated the number of links or artifacts found. If you select a set of elements that is not empty, the dashboard displays a pie chart with an overview of these links or artifacts. It is grouped by link types resp. artifact types to give you an immediate visual impression of the element distribution in your project. If there are no data available for the selected option, a notification will be shown in the center of the view. 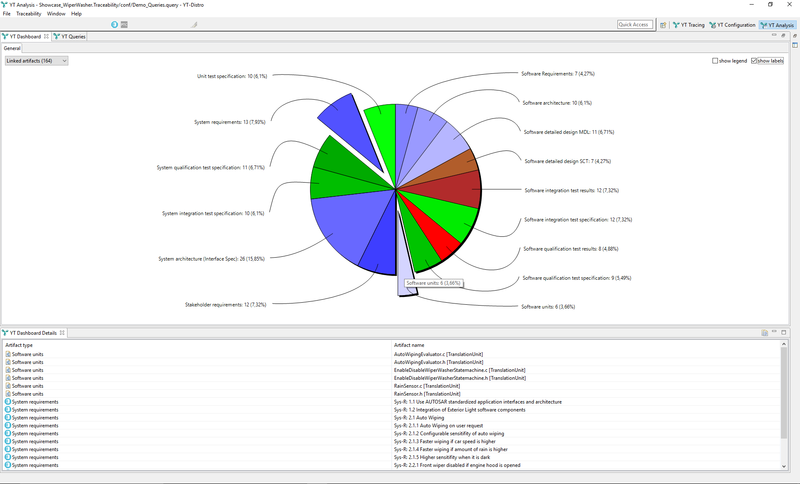 Check the Show legend or Show labels checkbox near the top-right corner of the view in order to see which kind of elements each section of the pie chart represents. In figure "Pie chart and drop-down menu in the YT Dashboard view" , both have been checked. 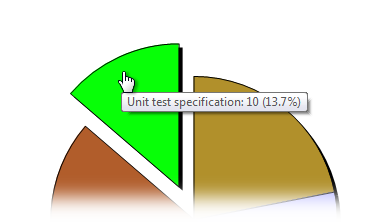 The pie chart labels are showing element information of the following format: "name: count (percentage%)". If you hover your mouse pointer over a pie section or legend item, a tooltip displays the element information in the format explained above. The pie chart is interactive: You can click on any of its sections (or on any legend entry) to investigate the corresponding elements in more detail. A click on a pie chart section explodes it, highlights the corresponding legend entry (if the legend is visible), and displays the elements the pie chart section represents in the YT Dashboard Details view . Click again, and the actions are reversed. The YT Dashboard Details view is linked to the YT Dashboard. As the name suggests, it displays details on the elements selected in the YT Dashboard view. In YT Dashboard, you select one or more types of artifacts or links, and in YT Dashboard Details, you can see all the artifacts or links themselves. The YT Dashboard Details view displays elements, i.e., links or artifacts, as a table. Each row represents one element and provides information on it. Artifact information are type, name, and origin tools. For a link, the view displays its type and the artifacts at the link’s ends. If an element type is selected on the dashboard and the YT Dashboard Details view is closed, it will be opened. In any case, the YT Dashboard Details view will get the focus. If no item is selected on YT Dashboard or the latter is closed, YT Dashboard Details provides either a clickable hint to open the dashboard or suggests to select a pie chart section. Selecting an element in YT Dashboard Details displays its properties in the Properties view. If an artifact has been selected, the YT Overview view displays this artifact and its relationships to other artifacts. If a link has been selected, the YT Overview view displays its both link ends, i.e., the A and B artifacts, and their relationships to other artifacts. The YT Dashboard Details view provides a copy to clipboard button at the right-hand side of its title bar. Select the table rows you are interested in – pressing [Ctrl+A] selects all rows –, then click on the copy to clipboard button. The table heading and the selected rows are copied to the clipboard as plain text. Within each line of this text, table cells are separated by [TAB] characters. Instead of using the copy to clipboard button, you can press [Ctrl+C] on the keyboard. The YT Queries and YT Query Results views operate in concert and allow you to create, edit, and execute queries as well as to view their results. Queries are stored in query files and displayed by the YT Queries view in a tree structure, with each query file at the top level, see the sample screenshot in the introductory section above. The queries contained in a query file are shown as subordinate nodes of the respective file in the YT Queries view. Query files must have the .query filename extension and can be stored anywhere in your workspace. A query file can contain multiple independent queries. Initially, you don’t have any query files, so the YT Queries view will be empty. Please note: Queries have no side effects and will never manipulate any data they are executed on. Click on the icon at the top of the YT Queries view. Select the New query file entry in the YT Queries view’s context menu. Both actions will open a file creation wizard asking for name and location of the file. 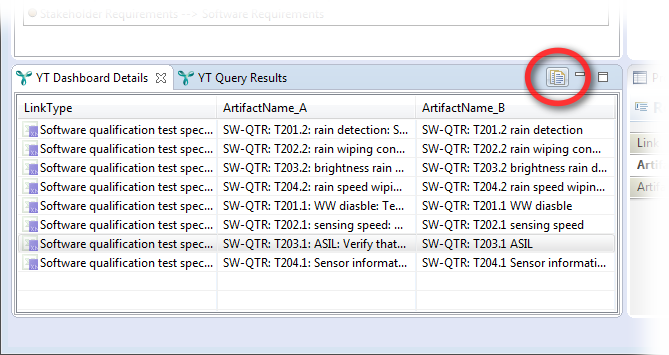 After the query file has been created, YAKINDU Traceability adds it to the YT Queries view and opens it in an editor. In this editor, you can formulate your queries, using the YT query language. You can add as many queries as you want to a query file, but it is advised to maintain different queries in different files or at least maintain a clear structure, depending on your queries' purpose and semantics. Double-click on the query file in the YT Queries view. Right-click on the query file in the YT Queries view, then select Edit in the context menu. Select the query file in the YT Queries view, then click on the button at the top of the view. 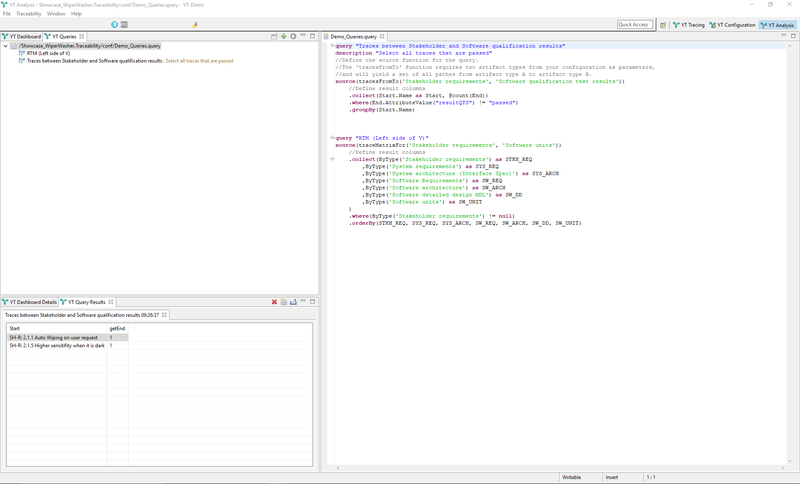 The query file will be opened in the query editor. Double-click on the query in the YT Queries view. Right-click on the query in the YT Queries view, then select Execute in the context menu. Select the query in the YT Queries view, then click on the button at the top of the view. After executing a query, the YT Query Results view shows the results. Please note that some queries may take considerable time to execute, dependent on their complexity and on the size of your data model. A progress bar will inform you about the status of the query execution. Each query execution adds a new result tab to the YT Query Results view. That is, you can execute the same query several times without loosing any results of formerly executed queries. To differentiate query results from each other, each result tab gets an individual name assigned, consisting of the query name and a time stamp. From the YT Queries view: In the context menu of the query, select Export query results. From the YT Query Results view: Click on the toolbar button Export query results. 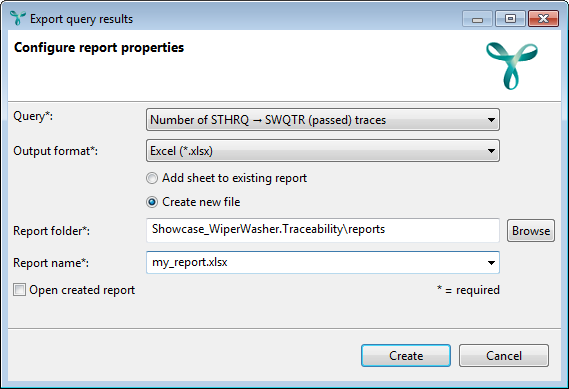 From the Traceability menu: Select Reporting → Export query results. Query: The query to be executed and whose results will be exported to an Excel or CSV document. Output format: Select the document format, either CSV or the Excel format .xlsx. However, please see option Report name below. Add sheet to existing report: If this option is selected, the report will be added as a new sheet to an existing Excel document. This option supports also append to files with the extension .xlsm, .xltx, and .xltm. It is not available for CSV export. Create new file: If this option is selected, a new document will be created. If the target document already exists, you will be asked for confirmation before overwriting the file. For CVS export, this option is automatically selected. Report folder: The folder the report file will be created in, overwritten in, or (in case of Excel) appended to. The folder must be located in an open project of the current workspace. Report name: The name of the report. This corresponds to the name of the Excel or CSV file that will be created or modified. It may optionally contain a filename extension, i.e., .xls, .xlsx, or csv. If a filename extension is specified, the Output format option will be ignored. If no filename extension is specified, the value will be automatically derived from the Output format option. If you selected a valid Report folder already, the drop-down menu will show the existing Excel and CSV files in that folder. This makes it easier to select a document to replace or append to. 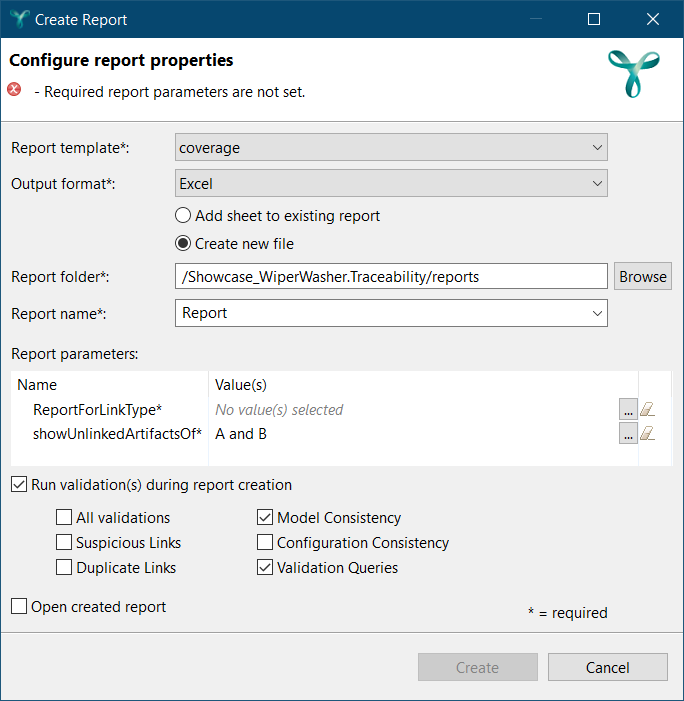 Open created report: Check this option to open the created report in Excel after the query results have been successfully exported. Please note: If the Excel document is already open in Excel, YAKINDU Traceability may not be able to write the file. In this case, a dialog will ask you to close the file in Excel and retry. 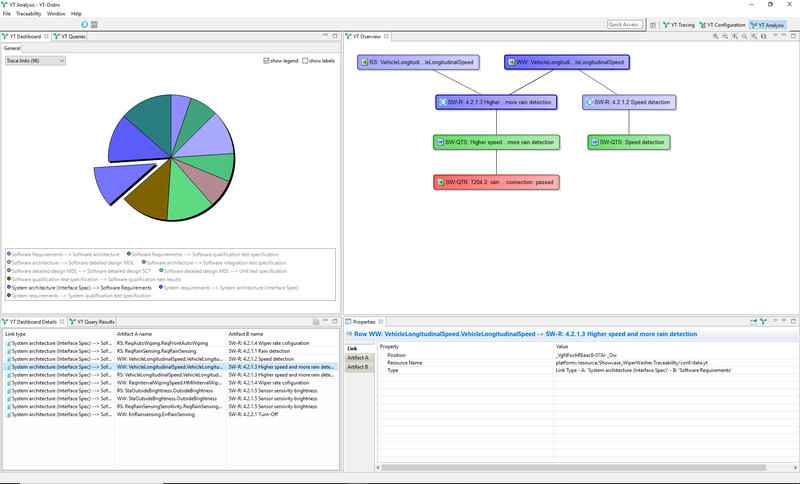 The YT query language enables dedicated analysis of and specific information from the whole trace model (i.e., the graph of artifacts and links, including unlinked artifacts, attributes of artifacts, and attributes of links) which has been created by YT based on the configuration and the information that has been extracted from the various data sources. Read an introduction to the YT query language and watch videos on how to create and execute your own queries in this blog post: "A language to analyze trace data efficiently". Extract relevant data. Based on the definition of the query, YT evaluates the trace model and collects all matching result elements in a result model set that is specific for the given query. In contrast to an SQL result set, the result model set is not a tabular, flat sequence of data rows, but an object-oriented data model with entities of possibly different types and with relations between those entities. Flatten the result model set. This step transforms the result model set into a tabular result set with “data rows” of a homogeneous structure. Filter, aggregate, and sort data. Process the result set. This is similar to SQL. A YT query consists of up to six elements which are listed in the table below and are described in more detail in the subsequent sections. Elements of a YT query are separated by a . (dot), possibly with blank space left or right from the dot. An exception are query meta data and data source: These query elements are separated by blank space. This is illustrated by the following example which utilizes all language elements. query "name" description "description of the query"
The expression specified in a source(expression) clause links to an algorithm which processes the trace model and returns a set of result models. The algorithm itself is a so-called query function implemented in Java. The expression can pass parameters to the query function. YT does not restrict the types of the model elements of the result model set in any way. A crucial characteristic of a query function is its return type. While YT does not restrict the element types of a result model set, all elements in the result model set of a given query are of the query function’s return type. The allArtifacts function is one of YT’s built-in query functions. The definition above shows that allArtifacts takes a single parameter of type TVMCArtifactType, which represents any artifact type. The result model set returned by allArtifacts contains all artifacts of the specified artifact type. It comes in the form of an Iterable of TVMDArtifact, i.e., as a sequence of zero or more TVMDArtifact objects, each of them representing an artifact of the specified type. Consequently, a YT query using the allArtifacts function in a source clause, as in, e.g., source(allArtifacts('TestCase')), populates the result model set with matching TVMDArtifact elements, in this case with elements of type TestCase. creates a result set with columns n and v containing the name and the version of the TestCase artifacts. Generally speaking, query clauses right from the source clause like collect, where, etc. are based on the element type of the result model set and consequently on the query function’s return type. If, for example, you replace the query function expression allArtifacts('TestCase') by a different query function, say foobar('TestCase') with a different return type, the whole query might become invalid. Apparently, being versed in the YT query language requires knowledge not only of the query language syntax, but also of available query functions, their return types, the specifics of these types, and the data model as a whole. Please find a complete overview of the built-in query funtions and their return types in section YT built-in query functions. Since YT recognizes query functions dynamically during runtime, it is easy to add custom query functions to YT and in this way extend the YT query language with evaluations that are specific to your development process. A collect clause defines which attributes of the model elements returned by the query functions are taken over as a result set row of the YT query. A collect clause defines rules for the relevant attributes column by column, the rules being separated by comma. Each individual attribute is defined by navigating the attributes of an element of the result model set. The syntax is a dot-separated expression defining the access to attributes and getter functions, similar to, e.g., the C# programming language. 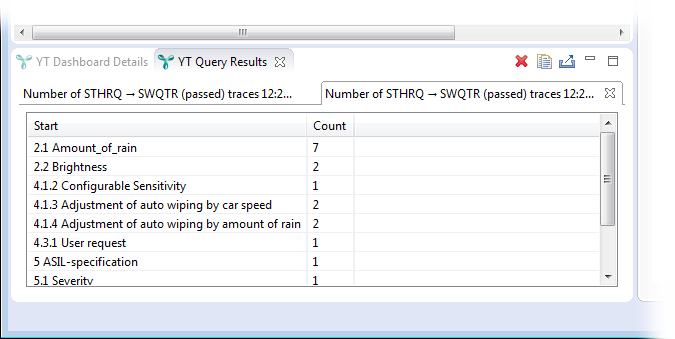 As an example, the query function tracesFromTo returns a set of traces. … and an identifier, e.g., the name of the file. query "Requirements covered by test cases"
returns a result set containing FileName and ID of Requirements which are (not necessary directly) linked to TestCases. A Requirement which has n TestCases assigned is listed n times in the result set. @avg(expression), @max(expression), @min(expression), @sum(expression) Calculates the average, maximum, minimum, or sum, respectively, in an aggregation. The specified expression must evaluate to a numeric value. @count(expression) Counts the number of elements. The expression is irrelevant for counting the elements, but it must be specified and valid. For example, @count(1) would be perfectly sufficient for counting the elements. @first(expression), @last(expression) Returns the first resp. last element of an aggregation. @join(expression), @join(expression, separator) Joins the elements of the expression to a string by using the separator string passed as the second argument or ', ' if no delimiter is supplied. The functions @avg and @sum only work on numbers and strings that can be converted to numbers (both variants can be mixed arbitrarily). Their result is always a number. In case of @avg, the result will be rounded to 5 digits in the fraction. For example, @avg for (2.3 ,7, “1e-12”) can be computed, but “1e-12” is too small to affect the result, because of the limit of digits in the fraction. The functions @max and @min work on arbitrary parameters, but will work differently depending on the kinds of parameters. If all parameters are numbers or strings that are convertible to numbers, they will be compared numerically. If at least one of the parameters is not convertible to a number, the string representations for all parameters are compared alphanumerically. For example, the result of @min is 10 for (“x”, 2, 10), while it is 2 for (2, 10). The result of @max for (“xa”, “xb”, “X”, 1) is “xa”, because lower case letters are alphanumerically larger than upper case letters. returns a result set containing the IDs of Requirements and the number of (not necessary directly) linked TestCases. Logical AND operator && Combines two boolean expressions by a logical AND. The resulting expression evaluates to true if the combined conditions both evaluate to true, else false. Logical OR operator || Combines two boolean expressions by a logical OR. The resulting expression evaluates to true if at least one of the combined conditions evaluates to true, else false. query "Requirements covered by manual test cases"
finds all verified Requirements with their respective number of linked manual TestCases. The requirements are grouped by the name of their sources. Within each group they are ordered by their coverage, i.e., by the number of test cases assigned. Every so often you are more interested in certain higher-level characteristics of a result set than in the individual members of a query result. A basic example would be to return the total number of requirements that are associated with at least one test case and the total number of those that don’t. This requires to first group the result set elements by an attribute like, say, hasTestCases, and then count the members of both groups using the @count aggregator function. Such a group is called an aggregation. The groupBy(Start.Name) puts all trace elements with identical requirement names into a group of their own, respectively. That is, if a requirement has, say, five test cases, then five of the trace elements returned by the query function will contain that requirement as their start attribute. These trace elements will be grouped into an aggregate of their own, just like other trace elements with identical requirement names. In the collect(Start.Name as Id, @count(End) as Coverage) clause, the @count(End) aggregator function is particularly interesting, because it counts the elements in each aggregation. The sample collect clause creates a result set with two columns: Column Id holds the requirement names, and column Coverage holds the number of test cases for each of those requirements. Aggregator functions work on aggregations and thus require a groupBy clause to be present in the YT query. It is possible to group a result set by more than just one criterion. Multiple feature selections are specified as a comma-separated list, e.g., groupBy(A, B, C). The orderBy clause is used to sort the result set by one or more columns. An example is given in section Where clause. YT comes with a lot of built-in query functions. As foreshadowed in section YT query language elements, these functions do not return plain data records, but a set of result models, e.g., models containing instances of artifacts and links. The result models returned by the built-in YT query functions are all based on the same meta-model. The returned models are complete; if, e.g., a function returns a set of links, it is possible to navigate from such a link first to the artifact at end A and then from there to the artifact type. Built-in query functions are useful tools for establishing traceability matrices, among other things. Learn what a traceability matrix is and what it is good for in the blog posts "5 + 1 questions a requirements traceability matrix answers" and "How to create a requirements traceability matrix in Excel". Returns all names of all test cases. Returns all names of all artifact types. Returns all names of all link types. Returns both ends of all links between requirements and tests. Returns all customer requirements without any assigned test results. “Assigned” in this case means “reachable via a chain of links”, e.g., from Customer Requirement to System Requirement to System Test Case to Test Result. Returns a query result that contains the “artifact” column for all elements contained in the query results of both q1 and q2. Returns the “Name” of “q1” and all "End"s for these artifacts in “q2”. Returns all names of all linked test cases. Returns all names of all test cases which are not linked. Returns the column “Name” from “AnotherQuery”. Returns a query result that contains the “artifact” column for all elements contained in the query result of q1, but not in that of q2. Returns all customer requirements with at least one assigned test result and the number of these assigned test results. “Assigned” in this case is defined as above. Assuming that the trace model looks as follows: “Customer Requirement” → “Software Requirement” → “Implementation” → “Test Case” → “Test Result”. The result will contain all distinguished traces between each and every artifact in the chain. Also unlinked artifacts are included. Returns a query result that contains the “artifact” column for all elements in the query results of q1 or q2. Each element is contained only once. Returns a query result that contains the “artifact” column for all elements in the query results of q1 or q2. Duplicates are not removed. For the results of the built-in YT query functions the most important domain objects and their relations are illustrated and described below. DataSource: Represents the origin from which artifacts or links have been extracted. For the Microsoft Word Adapter, for example, a DataSource represents the Microsoft Word Document. For the IBM DOORS adapter, the DataSource represents the DOORS module. Link: A single trace link between two artifacts. Attributes: A map containing the attributes of the link (as defined in the YT configuration of the link type). The values of this map are accessible by means of function AttributeValue(key) in the query language, e.g., collect(… AttributeValue("my custom Attribute") as MyCustomAttribute). Artifact: Represents a traceable artifact that may or may not have links. 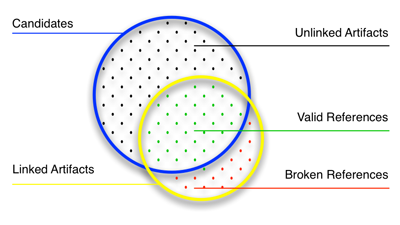 Attributes: A map containing the attributes of the link (as defined in the YT configuration of the link type). The values of this map are accessible by means of function AttributeValue(“key”) in the query language, e.g., collect(… AttributeValue("my custom Attribute") as MyCustomAttribute ). position: The information where the artifact is located in its data source. For example, for IBM DOORS, the position of a requirement is the absolute number. version: The current version of the artifact. The algorithm for version calculation depends on the technology of the adapter, e.g., for Microsoft Excel, the version is the union of the values of all configured attributes. For PTC Integrity, the version is the modifiedDate of the item being represented by the artifact. Trace: Represents a chain of linked artifacts, i.e., the n th artifact in the chain has a direct link from the artifact at position n-1 and a direct link to the artifact at postion n+1. artifactAtIndex(int n): The n th artifact in the chain. The index is zero-based, i.e., artifactAtIndex(0) equals start. LinkType: Reflects an artifact type specified in the YT configuration. Note: From a technical point of view, the above-listed attributes of a link type are not shallow attributes, but attributes of related objects, e.g., the attribute classification.name is the name of the classification the link type is related to. 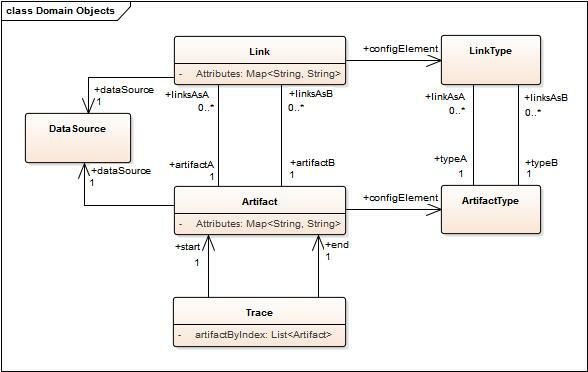 Nevertheless, from a domain point of view, “attribtutes of related objects” can be viewed as attributes of the link type. ArtifactType: Reflects an artifact type specified in the YT configuration. The default report shows simple traceability statistics only. Further reports (e.g., coverage analysis report) have to be implemented by the end users. The reporting is based on Eclipse BIRT (Business Intelligence and Reporting Tools). Reports can be designed with the BIRT WYSIWYG Designer. YT comes with data access drivers for BIRT to provide convenient access to traceability data. In the above example a coverage report is designed that shows User Requirements without System Requirements. 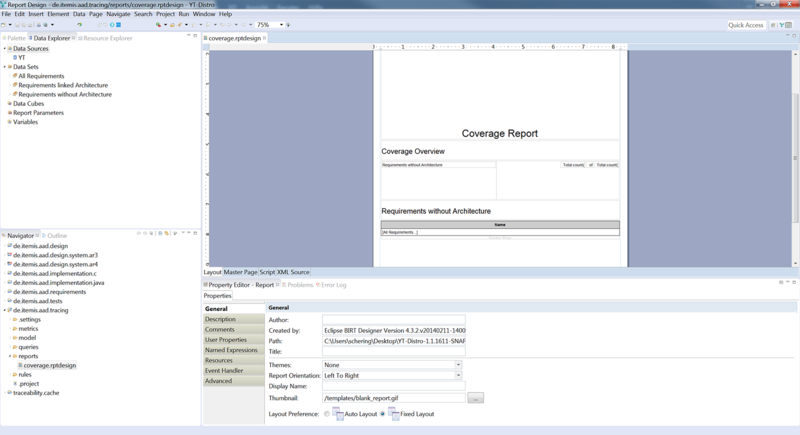 Coverage analyzes are calculated by joining and filtering corresponding data sets. During the design of reports often all possible artifacts of a specific type are required. These sets are called candidates. The figure below depicts the meaning of candidates. Below are sample exports of configuration and data. 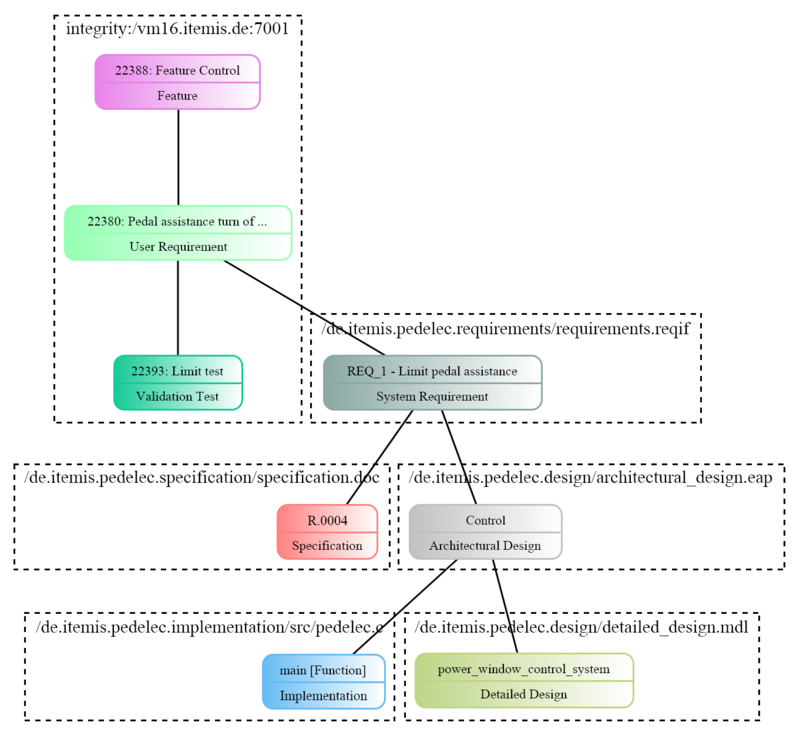 GraphViz can be downloaded from http://www.graphviz.org/.